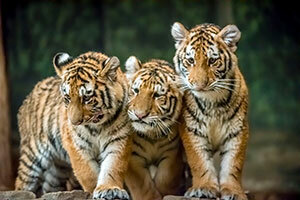 Now six months old, our tiger cubs are growing fast! Kashtan is becoming a big boy—just like dad, Strannik—and weighed over 90 pounds as of March. Eloise came in just under 80 pounds, with Bernadette slightly smaller at about 75 pounds. 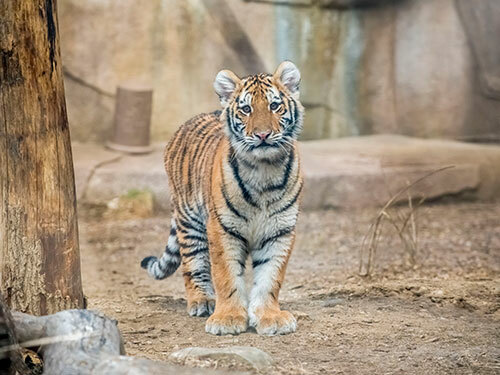 Typically, tigers take 2-3 years to reach their full adult height and length. Female tigers often grow to around 300 pounds, while males can reach 400 pounds or more. Keepers feed Kash about four pounds of meat daily, while the two girls each consume about three pounds. They have also started trying the same enrichment foods the adult tigers enjoy. Even though they’re getting big, the cubs are still very good with their crate training and continue to shift easily between the exhibit areas—the girls even still share the same crate during transfers. Keepers have been working on various training with the cubs, who now reliably climb onto the scale for regular weigh-ins. Keepers note that Kash and Eloise are extremely confident and like to roughhouse with each other, while Bernadette prefers to hang back and let her more outgoing siblings check out new things before venturing over herself to investigate. She is also usually the first to go down for a nap! But what all three cubs have in common is a love for water—they can be found playing in the pools continuously throughout the day. As they’ve gotten older, the cubs have also become very intrigued with different scents and perfumes. 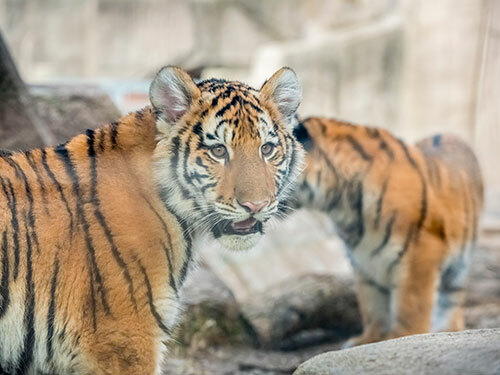 Kash was recently introduced to the outdoor Tiger Yard for the first time, tentatively exploring his new surroundings by crouching and sniffing along the perimeter of the exhibit—much the same way a domestic cat scopes out a new area. 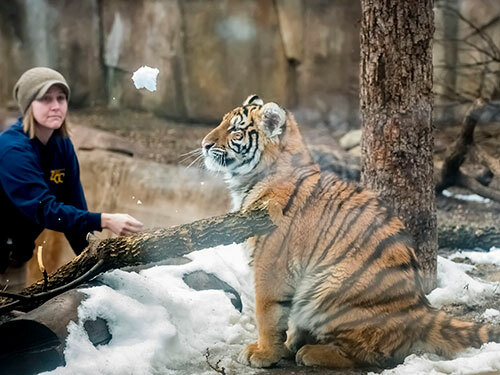 Although Big Cat keepers describe Kash as becoming increasingly independent—like a “teenager with a new driver’s license”—they are still able to go into the exhibit areas with him and he often “chuffs” at them—one of tigers’ primary vocalizations for communicating. Keepers have also observed Eloise and Bernadette becoming more independent from mom Amba, frequently charging through doors first when previously they would have waited for mom to lead the way. 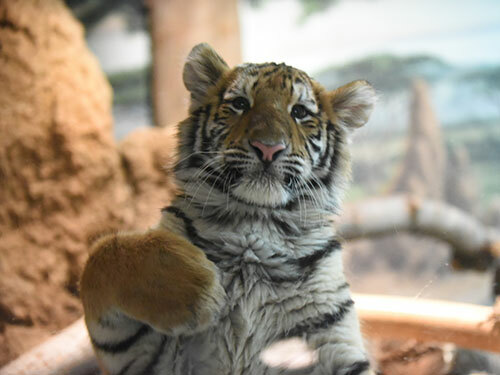 They also no longer play with blankets and plush toys, having graduated to “big kid” enrichment items like heavy-duty resin barbells and cubes. 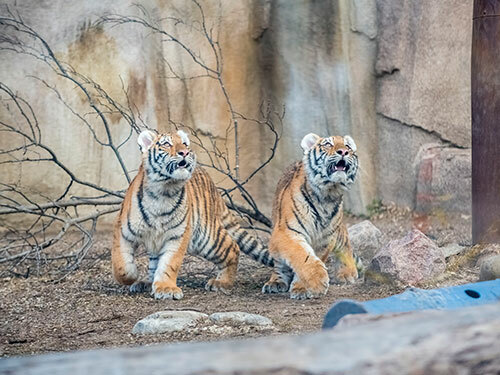 The two female cubs were recently introduced to the outdoor area as well alongside Amba, and soon visitors will be able to watch all three cubs interacting together outdoors. 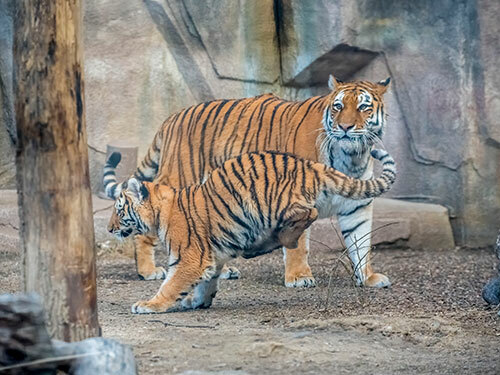 Currently, the three cubs are often on exhibit together in the large indoor Tiger Exhibit from around 9 a.m. to 4 p.m. daily, after which the girls return to spend the night with mom.